For the first time since 2001, the Chatham Anglers (4-0) have advanced to the Cape Cod Baseball League Championship Series. And, just as it was 17 years ago, the A’s will go head-to-head with the Wareham Gatemen (4-0) for a shot at the title. Game 1 of the series will be played Saturday night at Clem Spillane Field with first pitch scheduled for 6:30 p.m.
During the regular season, the A’s lost all four games they played against Wareham. The two sides faced off on June 12 in the first game of the summer with the Gatemen blowing past Chatham, 12-4. That set the tone for the four-game season series between the teams as the Anglers failed to win a game against their West Division foe in the regular season. However, both clubs sport drastically different rosters from their last meeting on July 11. The A’s have seen the return of Spencer Torkelson (Arizona State) and Wareham’s watched Joseph Matulovich (California), Sahid Valenzuela (Cal State Fullerton) and Ken Waldichuk (St. Mary’s) depart the Cape League. All three departures had success against Chatham in the regular season. Chatham’s Austin Bergner (North Carolina) will make his second start of the postseason Saturday. In Game 1 of the East Division Series, Bergner allowed two runs — one in the first and one in the sixth, his final frame — and three hits. From the start of the second inning to the end of the fifth, the right-hander retired 12-straight Harwich Mariners batters. Since being activated on July 5, Bergner has been one of the Anglers’ top arms. He logged a 2.38 ERA in four regular season starts, striking out 26 in 22.2 innings. Ryan Garcia (UCLA) was Wareham’s starter in Game 1 of the West Division Series against the Cotuit Kettleers and pitched exceptionally. The right-hander did not allow a hit in five innings while striking out eight and walking two. During the regular season, Garcia made seven appearances (six starts) and posted a 1.28 ERA with 33 strikeouts in 28 innings. In each outing, the California native conceded no more than five hits and one run. Garcia held opponents to a .238 batting average over his seven outings. 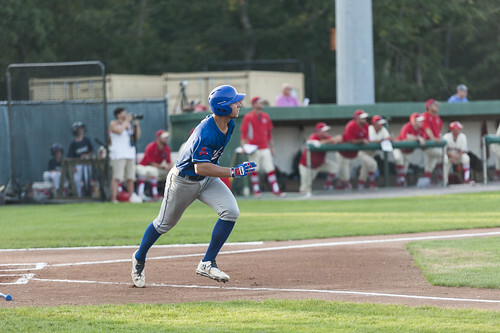 The Anglers are yet to lose a game in the 2018 postseason, sweeping Harwich in the first round and the Brewster Whitecaps in the East Division Championship Series. In both games against the Mariners, the A’s surrendered the first run of the game, which has typically led to an undesirable result. When conceding first, Chatham was 7-14-1 during the regular season. However, the Anglers’ big bats performed in time to secure consecutive wins. In Game 1, the A’s scored runs in all but two innings as Kyle McCann (Georgia Tech), Blake Sabol (Southern California) and Michael Busch (North Carolina) each left the yard en route to an 8-3 win. Colin Simpson and Kyle McCann have combined for seven hits and 10 RBIs in the postseason. In Game 2, Alek Manoah (West Virginia) logged an uncharacteristic start, and by the second inning, Chatham faced a five-run deficit. Two innings later, the Anglers had the lead. Colin Simpson (Oklahoma State) slapped two two-RBI base knocks and Tristin English (Georgia Tech) added one of his own to put the Anglers ahead, 7-5, by the end of the fourth inning. Both teams tacked on one more run as the A’s held on to clinch the series with an 8-6 victory. The opening game of the East Division Championship Series between Chatham and Brewster featured one of the most impressive displays of power of any Cape League game this summer. The two sides combined to blast eight home runs, five of which came off the Anglers’ bats. Torkelson mashed two round-trippers while Sabol, Simpson and John Rave (Illinois State) each scorched one of their own. Brewster’s Ray Alejo (Central Florida), Jesse Franklin (Michigan) and Christopher Wright (Bryant) launched balls out of Veterans Field, too, as the A’s managed an 11-6 win. After rain canceled Thursday’s contest, Game 2 was pushed to Friday. English took the mound for his first start of the postseason and threw a gem, coming within an out of pitching a complete game. The right-hander allowed five hits and two runs before being replaced by Kyle Hurt (Southern California), who struck out Cameron Eden (California) on three pitches to clinch a 3-2 series win. Facing the No. 4 Kettleers in the first round, the Gatemen used a dominant pitching performance from Garcia and timely hitting to scoot past Cotuit, 3-2, in Game 1 of the series. Austin Shenton (Florida International) cracked a solo homer in the fourth to break a scoreless deadlock. In the seventh, Oliver Dunn (Utah) hit a two-run single that provided the separation in an eventual 3-2 win. Game 2 featured Wareham’s offense at its best, but it took eight innings to get revved up. After posting a three-spot in the first inning, the two clubs battled for seven innings and were tied at five heading into the ninth. In the top of the frame, the Gatemen raked home 10 runs en route to a 16-5 series-clinching win. Five different Wareham players tallied at least two RBIs, including Shenton, who registered four hits, four runs scored and three RBIs. The Gatemen came from behind in Game 1 of the West Division Championship Series against the Falmouth Commodores. Ryan Kreidler (UCLA) homered and Shenton smacked an RBI single in the fifth to erase a two-run deficit before Skyler Hunter (Purdue) and Isaac Collins (Creighton) each drove in runs in the seventh to secure a 4-3 triumph. In Game 2, all but one Wareham starter tallied a hit while its first five hitters combined for six RBIs in a 7-4 win, advancing the Gatemen to the Cape League Championship Series.